I have to admit: I really liked the story behind this book. The idea of angels, fallen angels, and other creatures taking over the planet is an interesting concept, especially when they don't seem to be friendly in the least. Penryn is a likable enough character, as far as the young adult genre is concerned. There were aspects of her personality I found annoying, but probably no worse than I find most YA female protagonists. She has been hardened to a point, due to her family life and the dystopian world that she now lives in, and that makes her more believable, even if only a little. She still has a bit of that "far-too-immature-for-the-circumstances-to-be-realistic" vibe going on, a fact that annoys me possibly more than it should. Raffe, the other main character, is an enigma in so many ways. He isn't what he always appears to be, a fact that is never more apparent than in the final few scenes of the first book. The way the twist is presented makes it even more enjoyable to go back and take a closer look at previous sections with a fresh perspective. And that ending? Epic! Sure, it's subtler in its epic-ness than a lot of stories, but who can wipe that image out of their minds after having read it? I don't remember every detail of this book, but I remember that. I will never forget that. Where it missed the mark: Despite being a good idea, despite the story itself being fantastic, the characters could have used a little more realism in their creation. Penryn might be a teen, but she's seventeen and living in a world where she not only has to take care of herself, but also her mentally ill mother and disabled sister. Their world has been assaulted and taken over by a hostile enemy that treats them as slaves or worse. According to the book, Penryn is fairly well trained in self-defense, another factor that should help in molding her into a more mature person. I'm not saying that is always the case, but all of these factors combined do not allow her personality to strike me as true. She comes across as too juvenile at times, but I realize that these books were written for a younger audience. I just wish that Raffe's character was mature enough to balance it out. Sadly, that is only sometimes the case. Maybe that's just my opinion, but I think many of the tropes in these genres could be avoided with more realistic characters and dialogue. The quest, and subsequent journey, rings true, as do many of the scenes. The story is based on some very interesting and unique ideas. 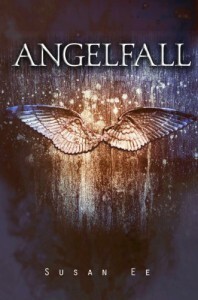 The execution sometimes leaves a bit to be desired, but overall I really enjoyed Angelfall. The ending was both unexpected and emotional. The next book in the series is possibly even better, but the last book suffered from a fatal flaw that I'll explain in the review for that book.